This is not really a new feature, it exists already for a while, but it seems that still a lot of people don’t know about it. 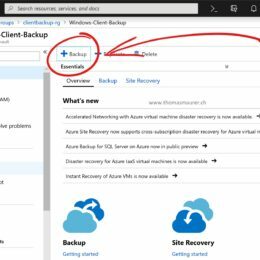 Azure Backup not only allows you to backup services in Azure or Windows Server and services on-premises, Azure Backup can also backup your Windows Client PC. 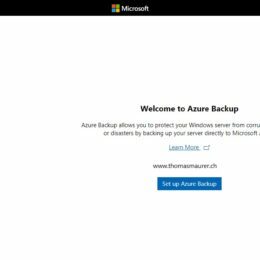 Azure Backup for your Windows 10 PC allows you to backup Files and Folders and store and backup them to the cloud. You can use this for small environments, VIP machines or for remote workers which are always on the road. Data is encrypted on the on-premises client machine using AES256 and the data is sent over a secure HTTPS link. 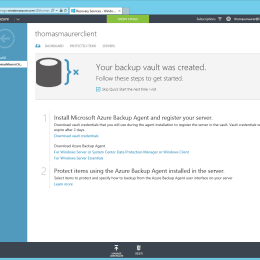 Backups are stored encrypted in Azure with the customers own key. I use Azure Backup for my own devices. I am often on the road and working on different documents and files. Obviously I also use OneDrive and OneDrive for Business, which also allows you to restore files after you delete them. However, the retention rate is way to short and it is not a backup. Azure Backup in that case is a great addition. You can backup your files where ever you are. 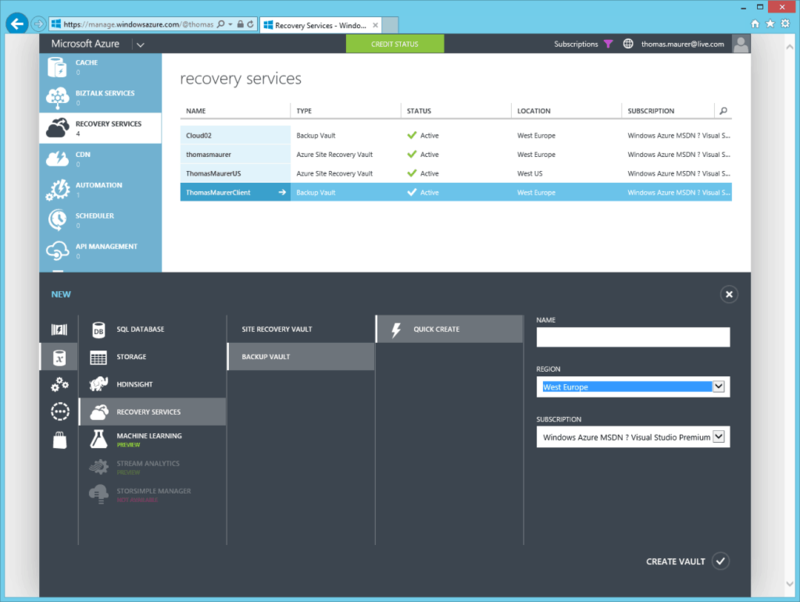 First you will need to setup a Azure Recovery Services Vault in Microsoft Azure. 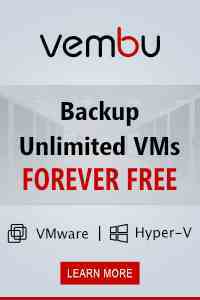 This is the service which your backups will be stored. With Windows Admin Center you have a great new web-based management experience for Windows Server. With Microsoft efforts to bring Hybrid Cloud capabilities closer to your on-premises systems, they added support for Azure Backup in Windows Admin Center. 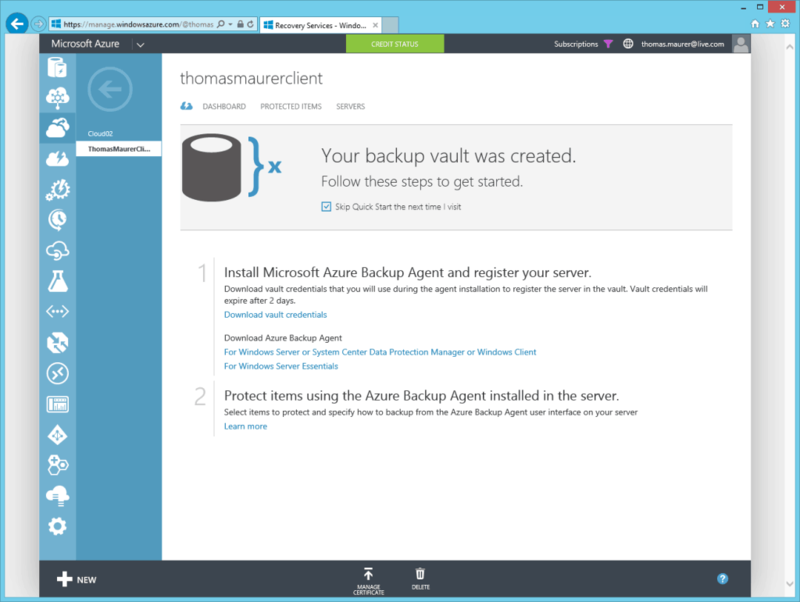 This allows you to simply configure Azure Backup for your Windows Server with a couple of clicks. Setting up a cloud backup of a server is simple and safes you a lot of time and resources. 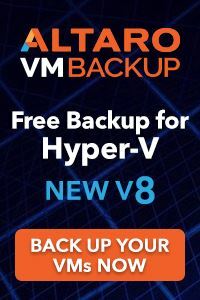 It is especially great, if you have a small environment in your datacenter or hosted at a different service provider, where having an own backup infrastructure doesn’t make much sense. 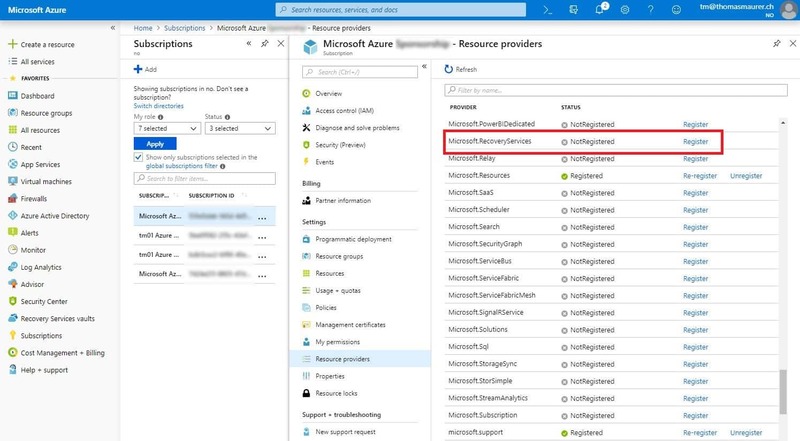 First you will need to register your Windows Admin Center to Microsoft Azure. This can be done in the settings of Windows Admin Center. If you haven’t done this yet, the wizard will guide you through. 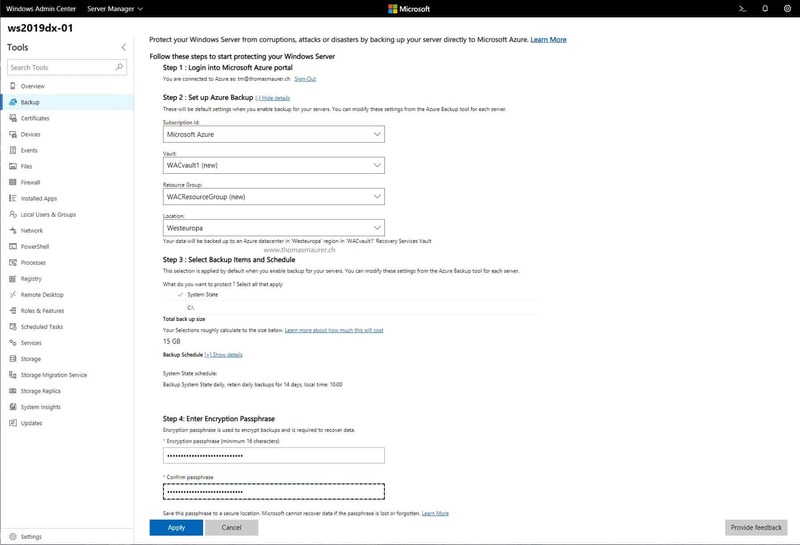 After this is done you can go to the Azure Backup Extension in Windows Admin Center and sign in. 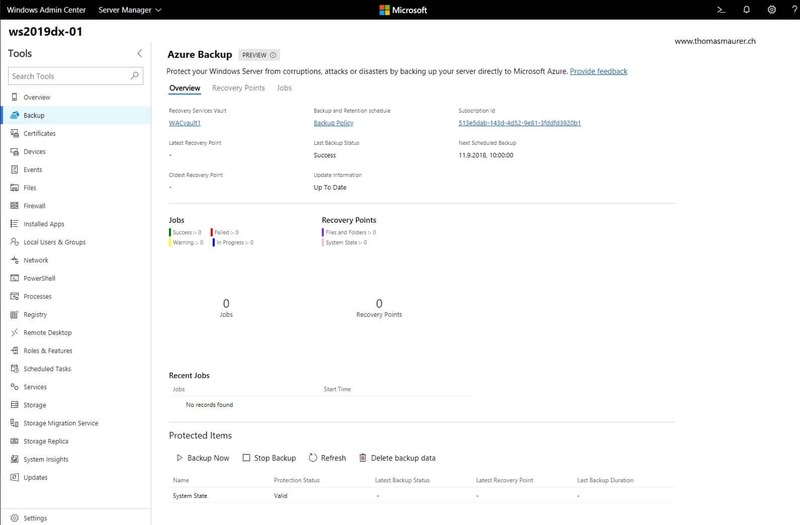 You can now configure Azure Backup directly in Windows Admin Center. 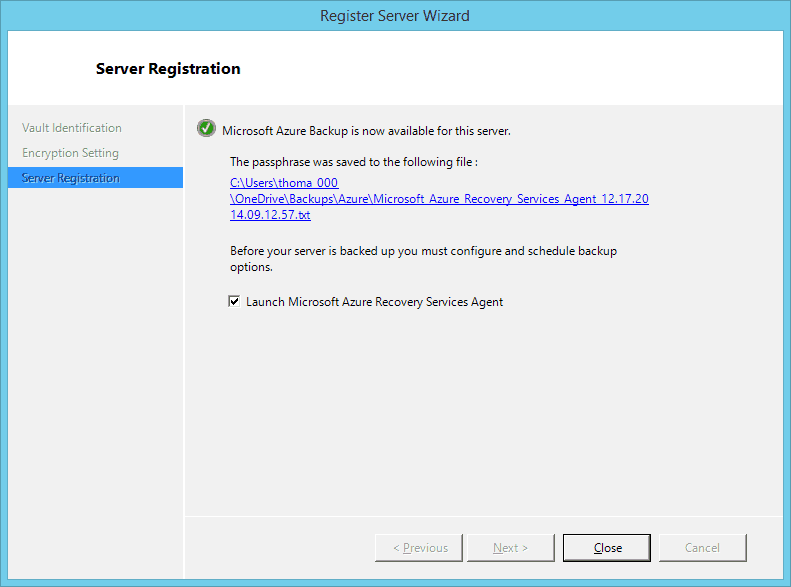 If you get the error message “Error Failed to create Microsoft Azure Recovery Services Vault. 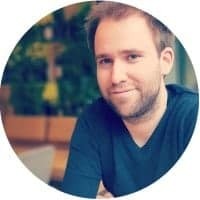 Detailed error: Das Abonnement ist nicht für die Verwendung des Namespace Microsoft.RecoveryServices” registriert.” You will need to register the Recovery Services Resource Provider in you Azure Subscription. After Azure Backup is fully configured, you can see the configuration, the latest recovery points and you also will be able to recover data. 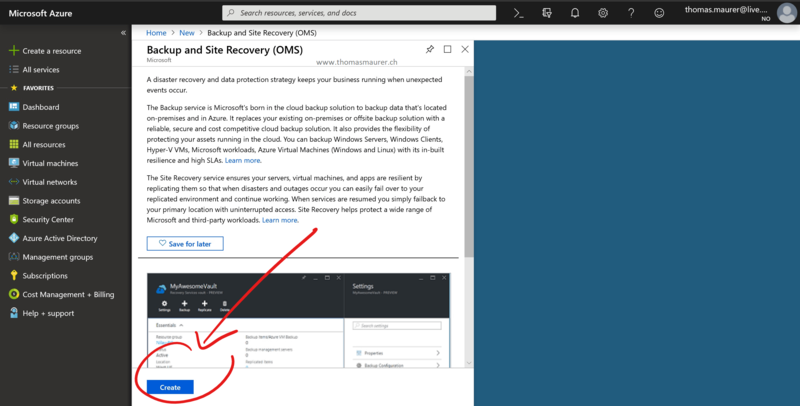 I hope this post was helpful and showed you how simple it is to back up your servers to the cloud using Windows Admin Center and Azure Backup. If you have any questions, feel free to leave a comment. 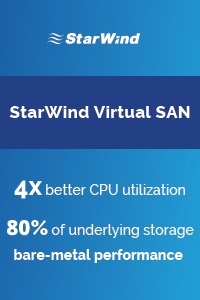 Also check out my blog post about Microsoft investments in Windows Server 2019. You can download Windows Admin Center here. Microsoft works heavily on their Microsoft Azure Recovery Services and releases new features for its Azure Backup software. 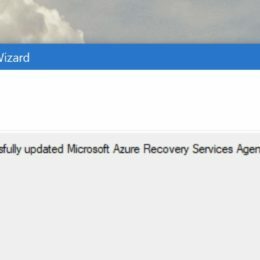 Some of these new features need a new version of the Azure Backup Agent, or MARS Agent, to work. 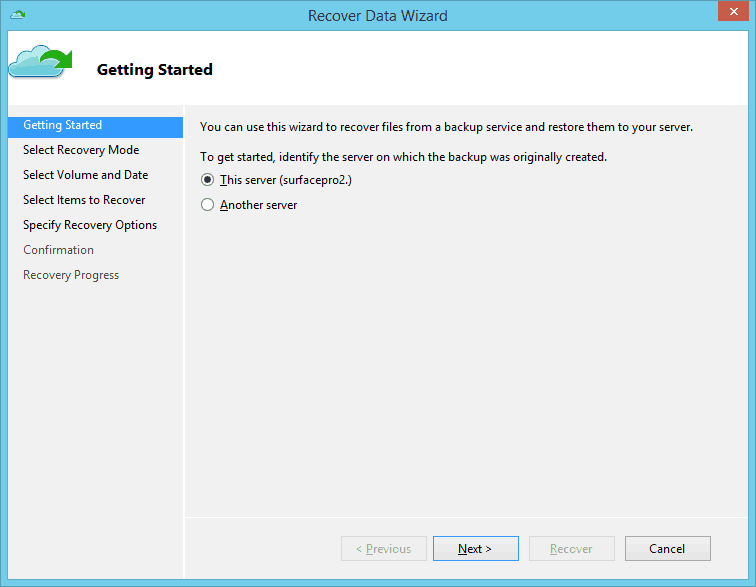 You can also use that file to updated an existing Azure Backup Agent. 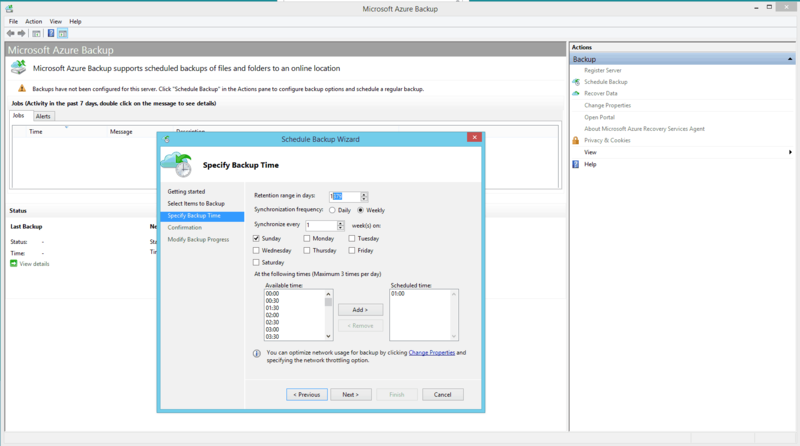 By the way, Microsoft Azure Backup now supports Windows System State Backups to Azure.